“Maccheroni alla chitarra” are considered the quintessential Abruzzo starter and are widespread throughout the region. 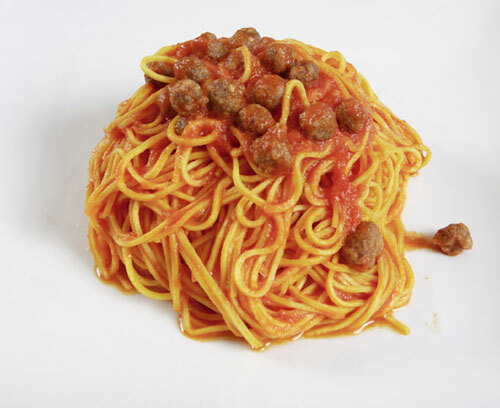 This square cross-section spaghetti is made from flour and eggs. 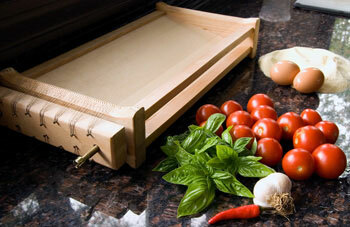 The pasta is kneaded for about 35–40 minutes and rolled out to produce a sheet of dough that is not too thin. 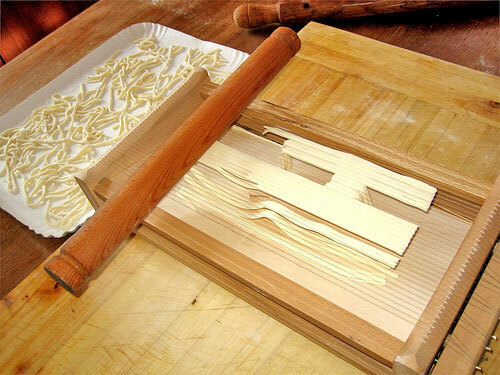 After the pasta has been rolled out, it is then sliced into 60cm strips that are about 20cm wide, then it is pressed over the “chitarra” with a rolling pin until the pasta strips fall onto the sloping surface inside the implement. 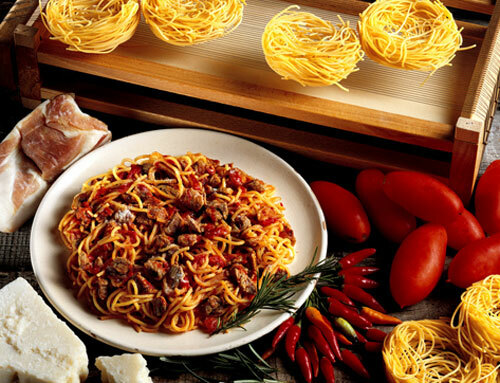 This type of pasta goes well with all sorts of sauces, but the most popular in Abruzzo include the classic meatball sauce, the three-meat sauce, or a tomato and basil sauce, and also with mushrooms and truffles or a seafood sauce. 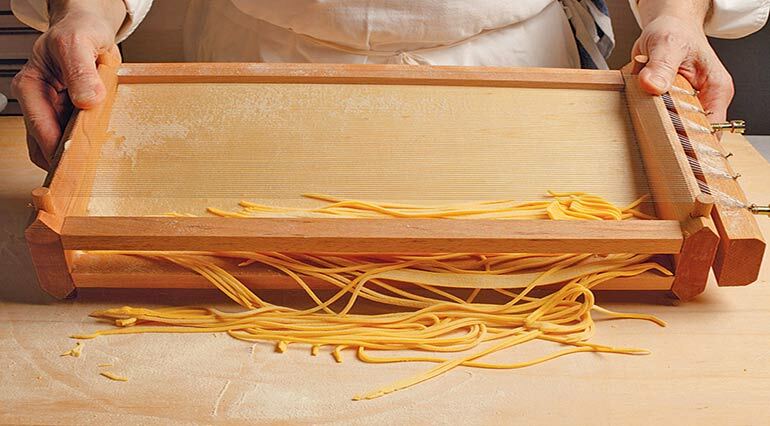 The name “chitarra” is derived from the implement used to cut the pasta. The “chitarra” (thus called because its steel wires vibrate and sound like a guitar) consists of a rectangular wooden frame or of two frames connected by a sloping board; wires are inserted between the two sides, 2-3mm apart for macaroni, whereas the opposite side of the double-frame version has wires spaced 4-6 mm apart, used to prepare fettuccine. The “chitarra” for making macaroni was invented over a century ago by the sieve-makers of San Martino sulla Marrucina, in the Province of Chieti, to help housewives to cut their “tajarelle” more precisely. The prototype is dated about 1860, following the introduction of steel or tempered iron wire to Italy by the Germans. 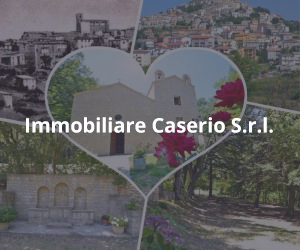 The implement was originally called a “carratore per pasta” (or “lu carratur” in local dialect) and is mentioned with this name in a Pescara notarial deed dated 1871, where it appeared among the many objects of a bridal trousseau. The name “carratore” is derived from the French verb “carrer”, which means to cut square, and was given to the implement in its place of origin, San Martino sulla Marrucina, at a time when French influenced Abruzzo dialect, from the eighteenth century to the end of the rule of Joachim Murat. It was not until the early twentieth century that the “carratore” began to be known as a “chitarra”. A vast bibliography proves the long and typically local tradition of macaroni “alla chitarra”. In particular there are important contributions from Rodolfo Molino [“Sulla chitarra- maccheronaio”] and Angelo De Victoriis-Medori in “La Cucina Teramana nella Gastronomia Abruzzese”, published respectively in issues 10 and 11 A.IV of the review “Abruzzo gastronomico”; lastly there is Rino Faranda’s “Gastronomia Teramana” (Ed. Tercas -TERAMO 1978).